Greetings. 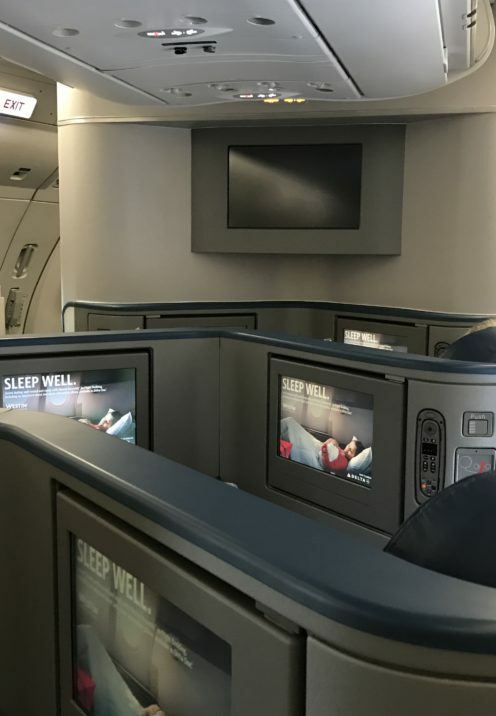 Today I want to share with you my recent experience flying the Delta One class of service on an Airbus 330-200 from Seattle to Amsterdam. 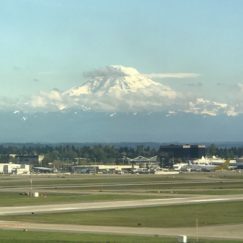 It is always a daunting task to decide on flights, classes of service and types of aircraft when planning a long distance and much anticipated trip. Brad and I save our American Express points and always use these hard won and highly coveted points for airline travel to Europe. We strongly believe that using reward points for airline travel is the best use of these points, as you can often get a roundtrip flight for the same amount of points you would spend on 1 night in a nice hotel. I’d much rather reward myself with transportation to Europe than one night in a hotel! The challenge then becomes finding the best flight and route to the destination one wants. In our case, we were embarking on a Uniworld river cruise that would sail from Budapest, Hungary to Passau, Germany. So, we needed to get ourselves from our home in Southern California to Budapest and back again from somewhere near Passau, Germany. 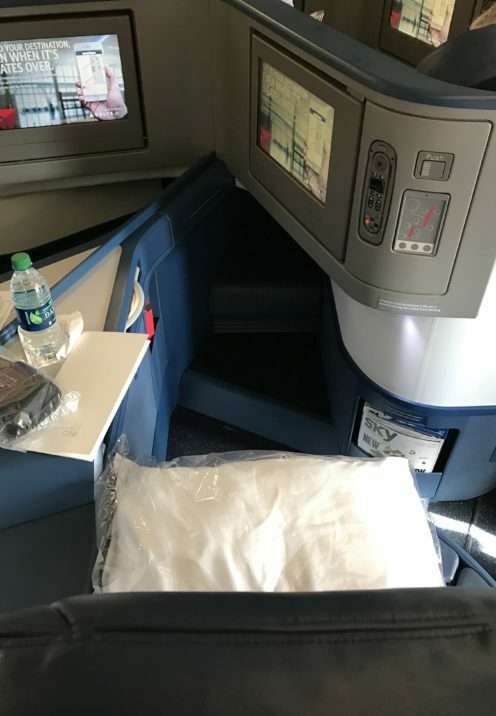 After days of searching AMEX airline partners, and doing so 1 year in advance, I finally settled on a Delta flight that was far from perfect in its itinerary, but would get us to Budapest and back in style & comfort (Delta One class of service) when we needed to be there. 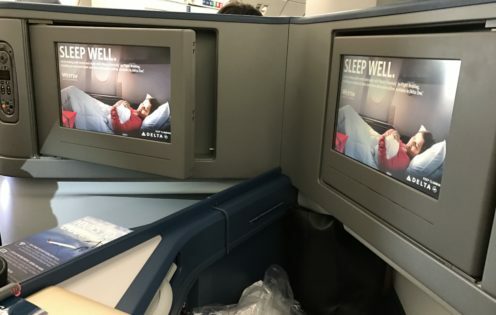 We would be starting our journey out of LAX and flying to Seattle where we would board our Airbus 330-200 for the second of 3 legs of our journey, a flight to Amsterdam. After changing planes yet again in Amsterdam, we would take a 3rd flight to our final destination, Budapest. It makes me tired just remembering the epic 21 hour journey we took that day back in May. 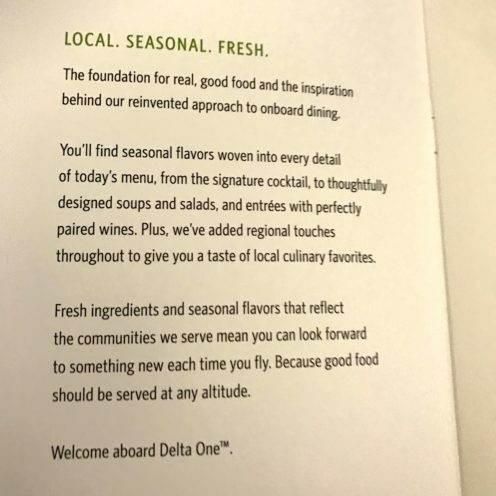 However, the good news is that we flew the bulk of the journey in what Delta calls their “Delta One” class of service. 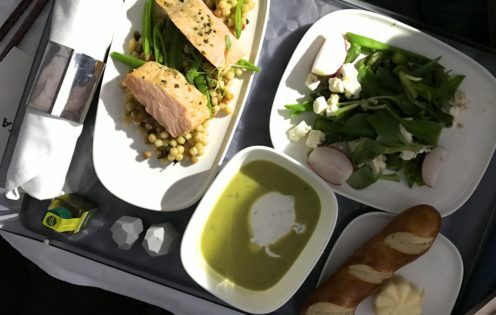 The best way I can describe it is it’s better than you’d expect from Business Class but it’s not quite what you’d expect from First Class. That said, it’s mighty nice. 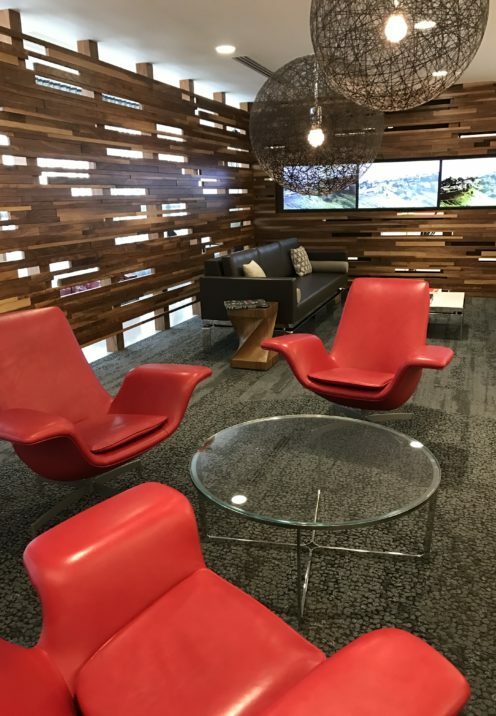 One thing that makes Delta One class of service particularly unique is their exclusive check in lounge and dedicated TSA security checkpoint. Passengers flying Delta One out of LAX wait here (see photo below) while a dedicated concierge prints boarding passes, tags luggage and checks passports. 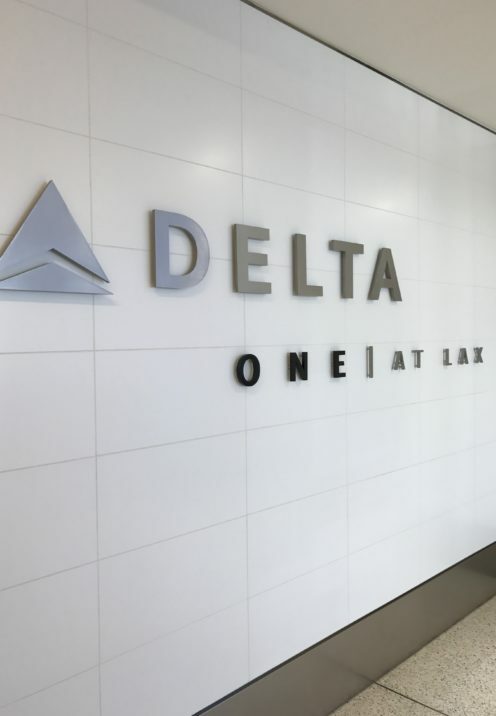 A private elevator then whisks Delta One passengers to a private TSA checkpoint sans lines. It’s a very, very nice way to embark on a much anticipated trip to Europe, as one is made to feel very special. 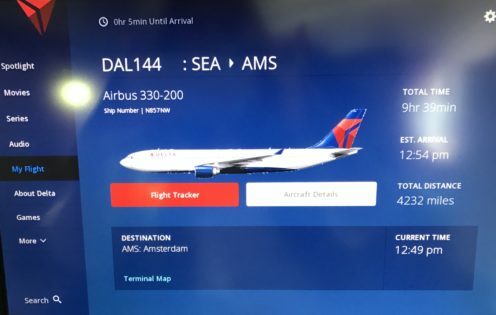 So for the purposes of this blog post we shall skip our quick flight to Seattle and concentrate on our flight from Seattle to Amsterdam on Delta’s Airbus 330-200. 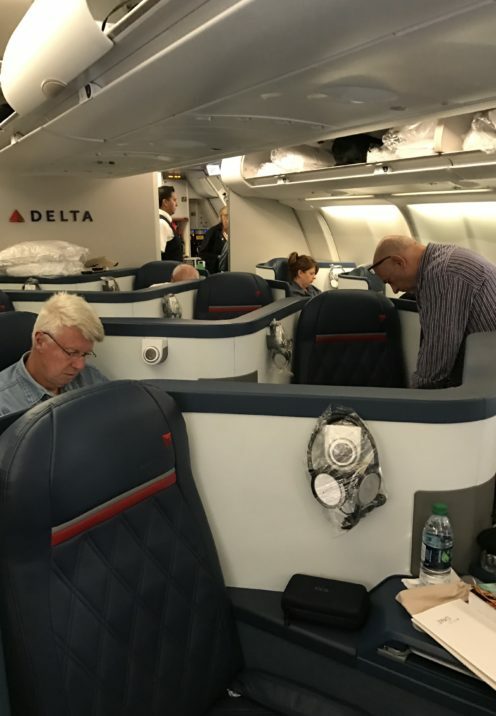 The last time we went to Europe we flew Delta One in their Boeing 767-300ER. I must say that the Airbus 330-200 was a superior and more comfortable experience. This was my seat, located in the bulkhead of the very front of the plane. I would have preferred a window seat but all of the window seats are single and I was traveling with my husband. So we shared a sort of “S” shaped cubby of 2 center seats. 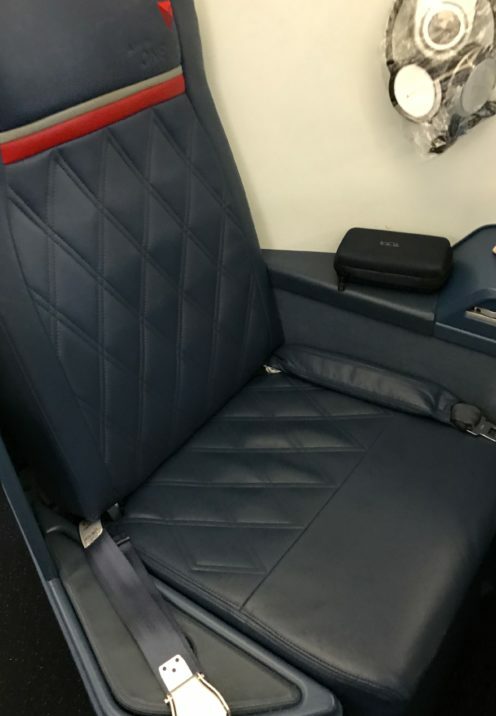 What is really great about this seat configuration is the fact that the lay-flat seats recline within a confined space that does not impact the seats in front or behind. So, I found myself adjusting the seat frequently to get it just right for my comfort, and doing so without worrying about the fellow behind me being impacted by my seat movement. 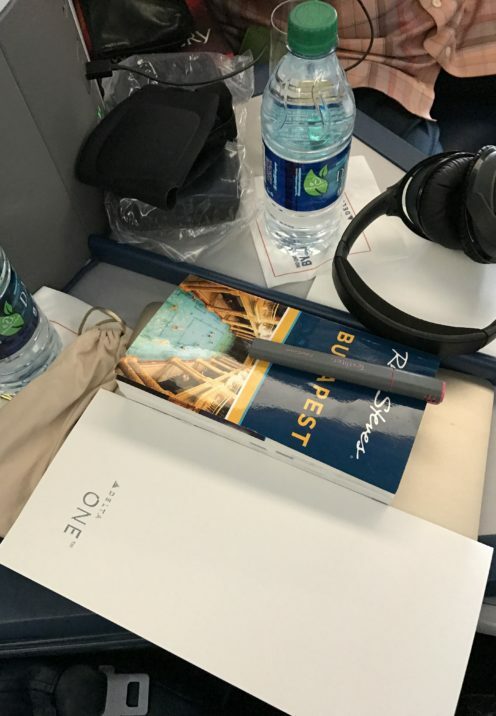 Arriving at my seat I found a pillow, comforter, bottle of water, large headphones and a Tumi amenity kit. 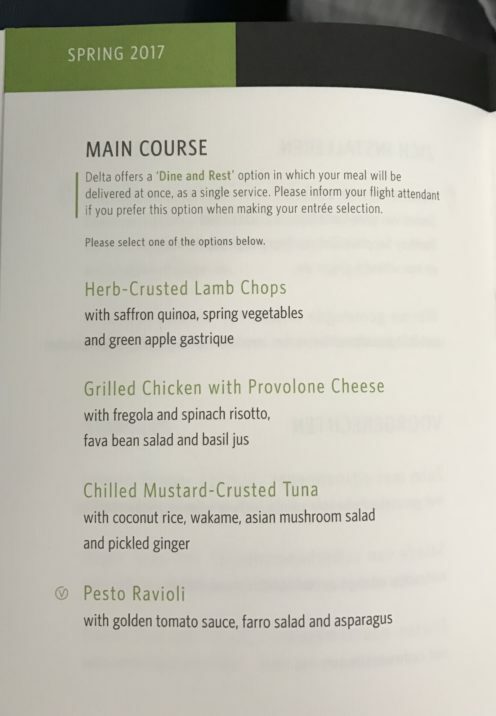 Our flight departed at 6:00pm, so the flight attendants passed out the dinner menus for us to peruse upon departure. I am terrible at sleeping on planes so my plan was to read Rick Steves Budapest for what ended up being most of the flight. I was super busy before leaving on this trip and felt unprepared for Budapest, so with my trusty highlighter in hand, I did indeed read the entire book on this flight. When we landed 21 hours later in Budapest I felt like an expert on Budapest. So now, let’s talk about the food. 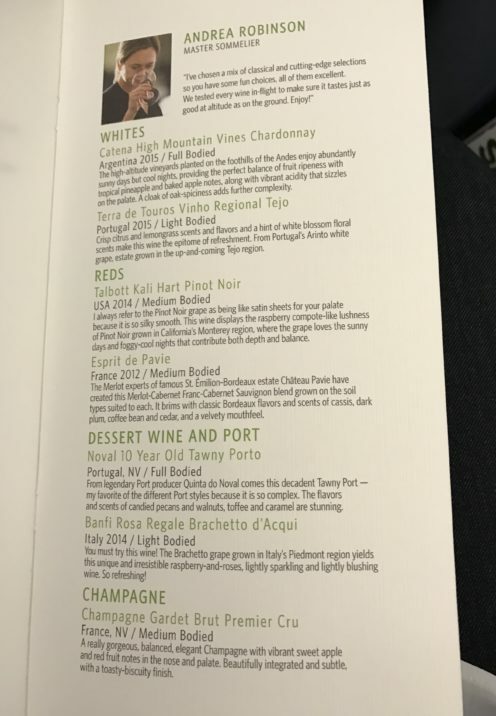 I’ll admit it, when I’m spending a year’s worth of hard earned AMEX points on a flight to Europe I’m not only hoping for a comfortable flight and good service, I look forward to eating and drinking to my heart’s content as well, and this flight did deliver in that department. Cocktail service commenced shortly after departure and I decided to try Delta’s Signature Cocktail, a gin, cranberry, apple & ginger juice concoction that I didn’t care for. 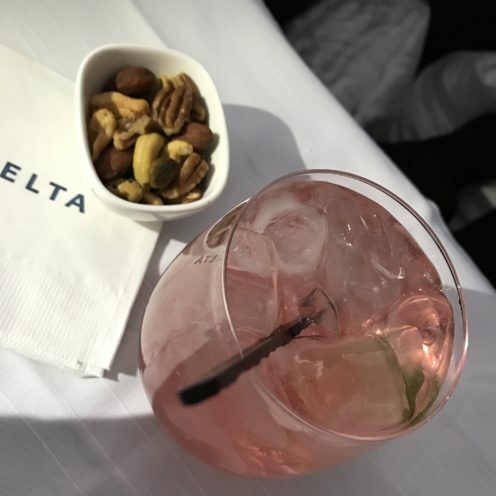 When the flight attendant noticed that I wasn’t drinking it she shared with me that she too felt it was too sweet and not very good and exchanged it for my favorite, a good old gin & tonic. The warm nuts are always a favorite and something my husband particularly enjoys. 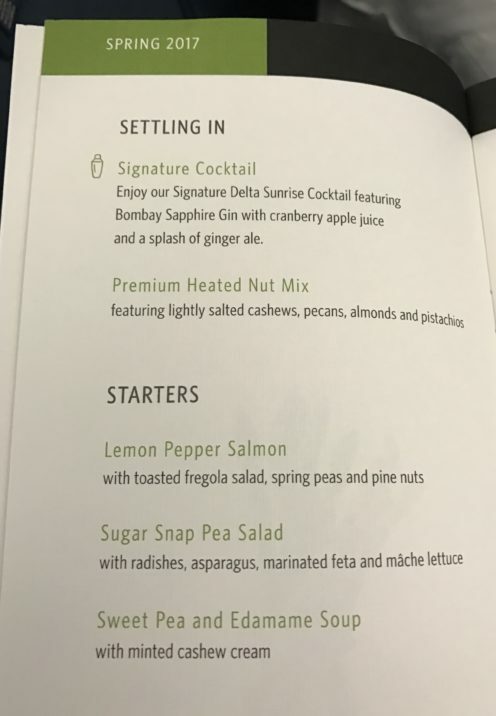 The next course was salmon on a bed of toasted fregola, a sugar snap pea salad and a sweet pea soup. It was all very delicious, albeit heavy on the peas. 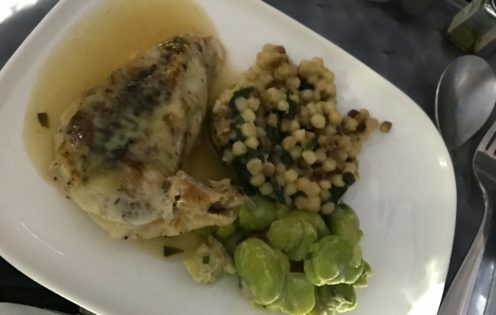 For my Main Course I chose the Grilled Chicken with Provolone Cheese, once again served over fregola with a fava bean salad. The photo of my food does not look very appetizing but funny enough, it was quite good. Actually, I was not familiar with fregola (little round balls of pasta that have been toasted) until this meal and I am now a HUGE fan! So much so that I ordered some on Amazon and plan to start making this delicious pasta regularly in the Becker household. You should try it too! 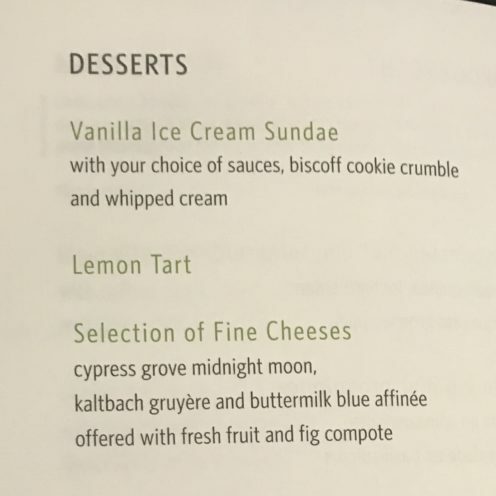 For dessert they came around with a dessert cart offering up ice cream sundaes, lemon tarts and a selection of cheeses. They also have a selection of dessert wines and Port. I decided on a glass of Port and an ice cream sundae. 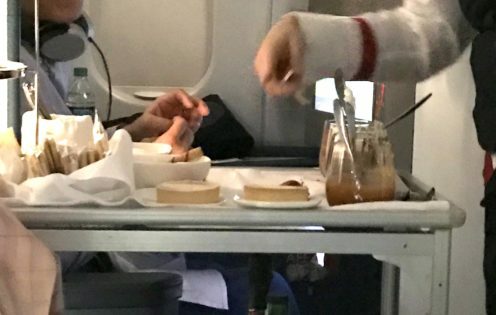 What I find with regard to sundaes on flights is that they are either served rock-hard or too soft. 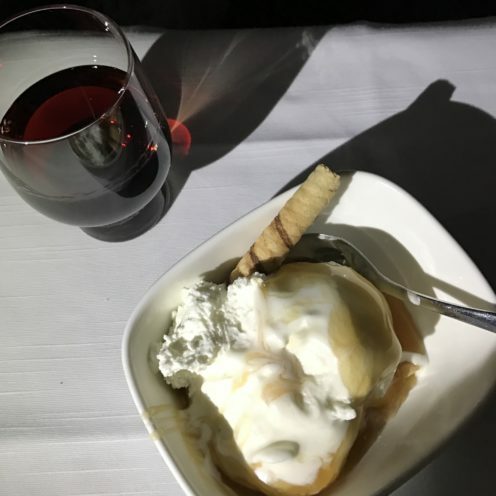 In my case on this flight the ice cream was very soft and almost melted by the time it got to me, not how I like it. 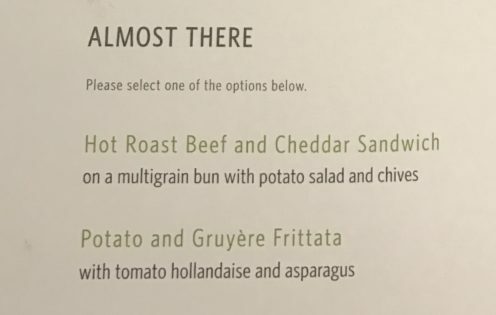 So, those unnecessary calories were not consumed. About an hour before our arrival in Amsterdam breakfast was served. It started with coffee, tea and juice service. Although I was not hungry I selected the Potato & Gruyere Frittata. The Tomato Hollandaise that accompanied it was really delicious. 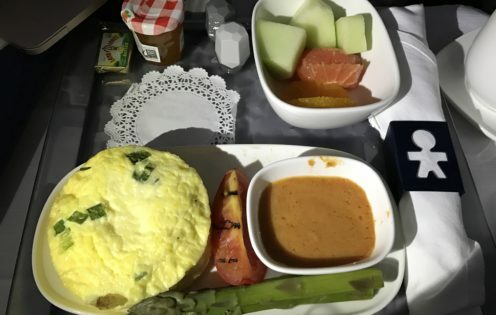 All-in-all we had a comfortable flight with good service and good food. Touching down in Amsterdam we made our way to our 3rd flight of the day from Amsterdam to Budapest. We arrived in our final destination, beautiful Budapest, at 4:00pm, 21 hours after our departure from Los Angeles. 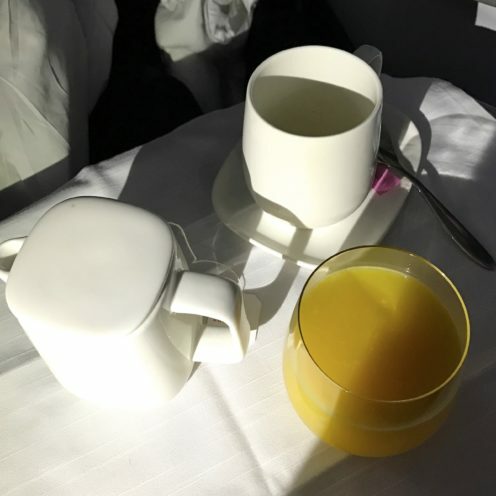 I actually love arriving in Europe in the late afternoon as it gives you just enough time to get to your hotel, have dinner and GO TO BED at the regular bed time of one’s destination. This helps to alleviate jet lag tremendously. 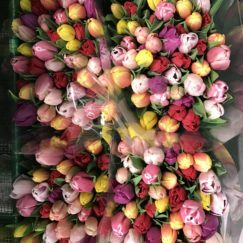 And speaking of jet lag, have you read my handy-dandy guide to how to avoid the dreaded jet lag? Check it out here. 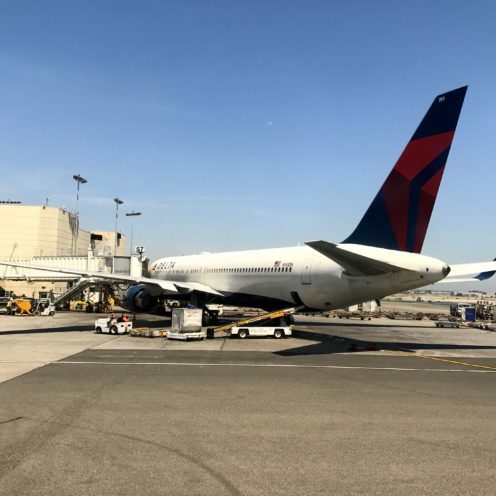 In closing I thought I’d share with you a video walkthrough of Delta’s A330-200. Stay tuned and in my upcoming posts I’ll share with you our fantastic stay at The Ritz-Carlton Budapest, and we will explore Budapest, my new favorite city. Then I’ll be taking you with me on a Uniworld River Cruise down the Danube. All opinions expressed in this post are my own. Unless otherwise noted, all photos are the original property of Celia Becker @ www.AfterOrangeCounty.com and may not be reproduced without specific permission. This post contains affiliate links which help to make this blog possible. Thank you for your support.